Win a $50 Gift Certificate to Won Kow Restaurant! Congratulations to Luke Martinez on winning our twenty-first High Five Giveaway and thank you to all who entered. Everyone’s new year’s resolutions were fantastic and we wish you luck keeping them! 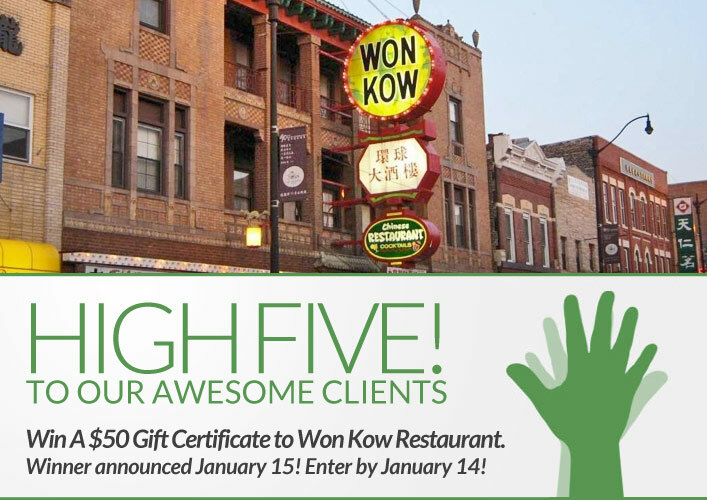 Our next High Five Giveaway is for a $50 gift certificate to Won Kow Restaurant. A visit to Chinatown wouldn’t be complete without a visit to the historic Won Kow Restaurant. The business was established in 1927, making it Chinatown’s oldest Chinese restaurant. Manager Dave Hoy attributes the restaurant’s longevity to tourists and a dedicated customer base of local residents. “It’s not unusual for us to serve people who have been customers for decades,” Hoy says. “Just last week, there was a gentleman here who has been coming since the 1930s. That’s pretty amazing.” The restaurant is located on the second floor of the building and can be reached only by climbing a set of steep stairs. Won Kow Restaurant is located at 2237 South Wentworth Avenue Chicago, IL 60616. Visit their website at www.wonkowrestaurant.com or call them at (312) 842-7500 for more information. What is the name of the Aveda product line that works great to add moisture to your hair? Hint: See the most recent blog post about fighting hair frizz during the winter for the answer! Now, just add a comment to this post with the right answer to be eligible to win! The winner will be announced on Tuesday, January 15. Entries must be received by midnight on Monday, January 14. Dry Remedy Moisture line. This has to be the answer!!!! Aveda’s Dry Remedy line! It works great!! Aveda’s Dry Remedy Line works great to add moisture to your hair. Aveda’s Dry Remedy Porduct line. The Aveda’s Dry Remedy line!